Because Newport is geared more for bikes, scooters and walkers, those who rent or bring bikes to get around town may find themselves moving faster than the cars on busy summer weekends. Many people bike to 1st beach, or take a long leisurely ride (about 7.5 miles) around Ocean Drive and stop in the middle at Brenton Point to relax and take in some ocean vistas. Some of the other great places to bike are to be found in the Point and Historic Hill sections of town, where you can look at one of the largest collections of pre-1800 architecture in the country. Some like to travel the length of Bellevue Avenue (about 2.5 miles) and look at the mansions along the way. Whatever your activity, chances are that biking can be a part of it. The fact that Newport is on a relatively small island offers little resistance to the adventurous biker. To the east over the Sakonnet River Bridge lies Tiverton and Little Compton (Rt. 77). This is a quiet single lane country road in good condition that runs down to the mainland ocean beaches in Little Compton about 20 miles from the bridge. For the mountain biker, trails can be found just a short drive away in Exeter (about 30 minutes) at Arcadia Park. The park consists of over 12,000 acres of land, showcasing the best nature preserve in Rhode Island. The 30 miles of trails are maintained by The Appalachian Mountain Club and the Department of Environmental Management, with 12 parking lots located throughout the area. Whether you want to just bike around town, out on Ocean Drive, or off-island, Newport and the surrounding towns have something to offer. These area bike shops can assist you with rentals and more information about touring the Ocean State. More Information About Biking Around Newport. 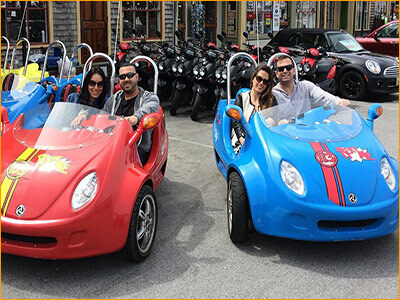 Not just your average scooters here - Scooter World offers a fun and easy ride with their new trike bikes. Three wheels means they are completely stable and you can fit 2 passengers in each car. Loads of fun for people of all ages. If you prefer the traditional scooter, they've also got plenty of shiny new scooters from which to choose. Rent by the hour, partial or full-day. Highly recommended way to see all of Newport and take in the ocean air! Featured in The Blog for Lifestyle and Travel: Rhode Island Bucket List: 50 Top Things To Do In Rhode Island". A fun little resource for those visitors who want to really experience all of Rhode Island on their visit! 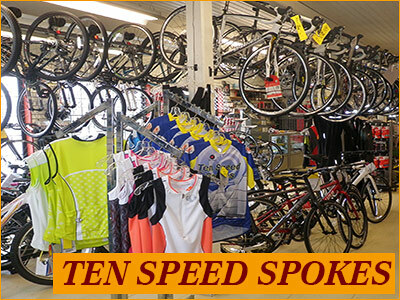 Whether you want to rent a bike, buy one or just have some service done on your own bike, Ten Speed Spokes is conveniently located next to the Visitor's Center right off America's Cup Avenue at the entrance to town. Inside you'll find exceptional service, a wide array of bikes to choose from, and convenient access to downtown Newport and its waterfront activities.